I know some of you are covered in snow right now (and I’m jealous, trust me) but I have to tell you that it so feels like spring in Texas! They weather is amazing, the bluebonnets are popping up, and the berries are already so delicious! I am buying pounds and pounds of fresh berries every time I go to the grocery store and I’m putting them in everything I eat. I can’t get enough. I just want to bake ALL THE THINGS with berries. 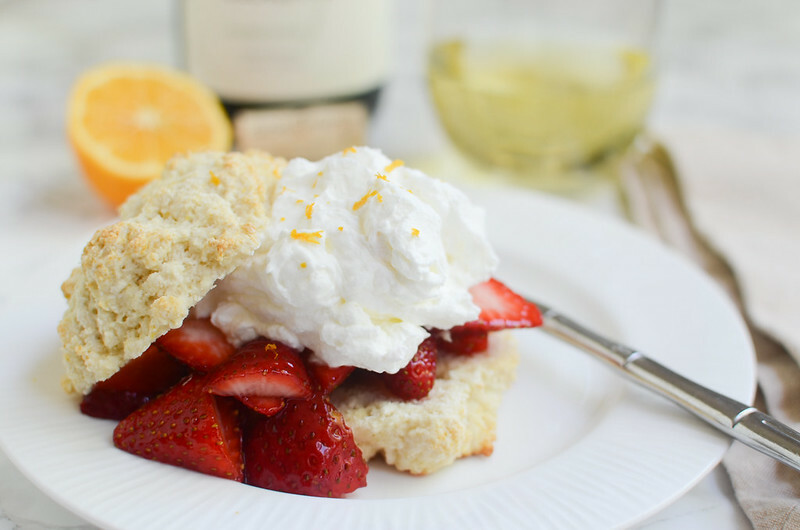 I decided to make these Meyer Lemon Strawberry Shortcakes because I wanted something to pair with my favorite Gloria Ferrer wine. Gloria Ferrer Caves & Vineyards is Carneros’ original sparkling wine house, owned and founded by the Ferrer family of Spain. The winery opened in 1986 in the breezy, now-famous region in southernmost Sonoma County. Their wines have earned over 400 gold medals and 50 90+ scores in the last 5 years. 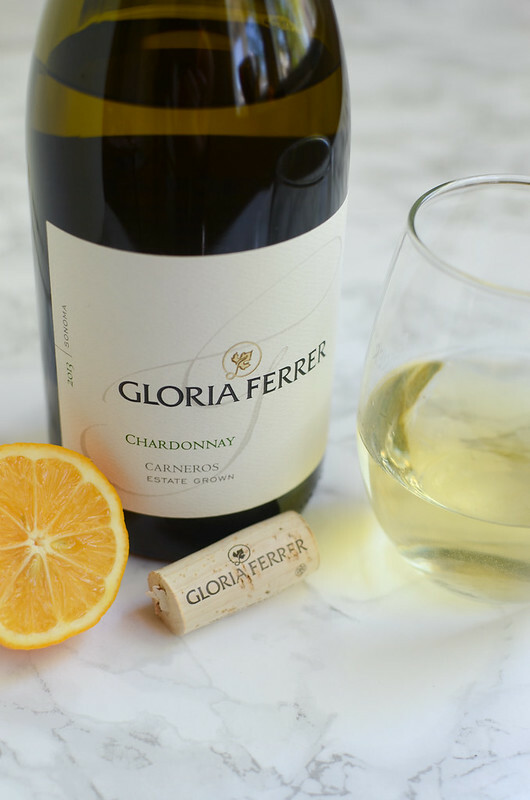 My personal favorite Gloria Ferrer wine is the Chardonnay. It’s aged for 9 months in French oak barrels to intense complexity. It has notes of peach, pear, pineapple, and meyer lemon, as well as the delicious toasty oak note. 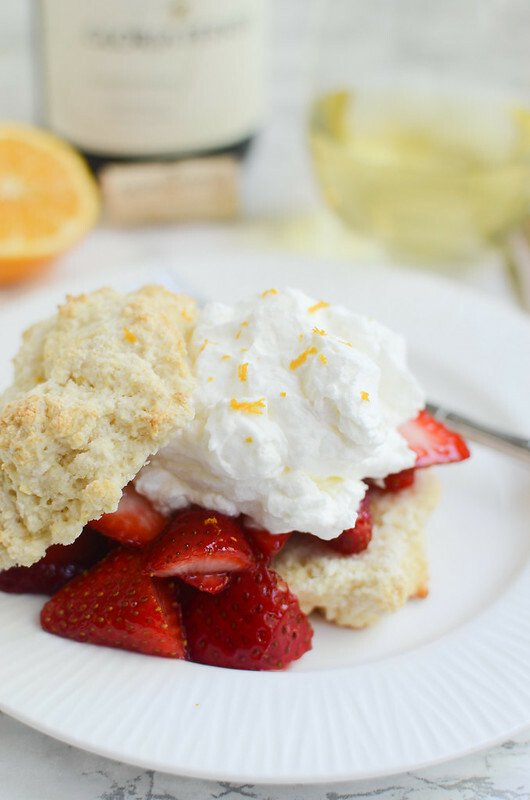 I thought the bright citrus flavor of the Chardonnay would be perfect with these shortcakes! If you haven’t baked with meyer lemons yet, you’re definitely missing out! They’re a bit sweeter than regular lemons, a little bit like an orange. I actually caught my 4 year old eating one the other day and couldn’t convince him that it wasn’t an orange! So the shortcakes themselves have the meyer lemon zest inside and then they are topped with sweetened strawberries! And then you put a big dollop of meyer lemon whipped cream on top to make them extra delicious! I loved the meyer lemon twist on a classic and they really did pair wonderfully with the Gloria Ferrer Chardonnay. Make sure you check out the Gloria Ferrer website to find out more about the winery and the other wines they offer! In a large mixing bowl, whisk together flour, sugar, baking powder, and salt. Use a pastry cutter to cut in the butter until the mixture resembles coarse crumbs. Stir in meyer lemon zest and milk until just incorporated - do not overwork! Drop by heaping tablespoons onto the prepared baking sheet. Bake 12 - 14 minutes or until golden brown on top. Cool before serving. Prepare the strawberries while the shortcakes are baking by combining the sliced strawberries and sugar in a bowl. Toss to make sure all the strawberries are coated and refrigerate until ready to serve. To make the whipped cream, beat the heavy whipping cream to soft peaks. Beat in powdered sugar and meyer lemon zest and beat to desired consistency. 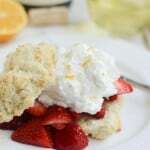 To assemble the shortcakes, split each shortcake in half. Add a spoonful of strawberries and whipped cream to the bottom of the shortcake. Place the top of the shortcake on top. 2 Responses to "Meyer Lemon Strawberry Shortcakes"
Yep, I was in shorts and a wide brimmed hat yesterday for opening day. And a baseball shirt. I was quite the fashion statement. #not. But that’s besides the point. Meyer lemon and strawberry anything! And homemade biscuits. GIMME.